The rain forests are the most exuberant forest ecosystems with the most abundant biological diversities on the globe. The common height of the forests is 30-50 meters, and the highest could be as tall as 70 to 80 meters. The leave canopies of the rain forests are very close, the sunlight, after being sheltered by layers upon layers of leaves, could only reach the ground by 5%. Since rain forests are very humid and high in temperature, numerous shady plants settle in them. Many of these plants grow on the tree trunks, branches, forks or even leaves, and they form "gardens in the air"; and some others grow on the ground surface, and they also create peculiar scenes in the rain forests. 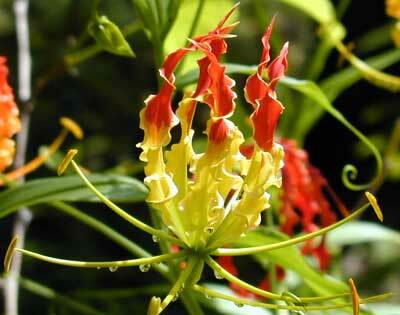 The shady plants in the rain forest are rich in varieties and many of them are good ornamental plants. In order to display and to protect them, the Tropical Botanical Garden of Xishuangbanna especially established a garden of shady plants. The garden occupies an area of one hectare and collected and transplanted more than 200 varieties of tropical orchids, and more than 500 varieties of fern, zingiberaceous plant, Plantaginaceae etc. Within the garden, the visitors could appreciate staghorn fern, Neottopteris nidus, variety of tropical orchid and many other shady plants coming from rain forests in other parts of the world.